When it comes to storing your hazardous materials, you need hazardous material storage containers tailored to fit your needs. This means that your hazardous material storage containers should be built specifically for the hazardous materials you intend to store. Buying used hazardous material storage containers puts you at risk not only of government fines, but of hazmat situations that could be harmful to the well-being of your community, environment, and personnel. Fully customized hazardous material storage containers are the safest, most compliant route to help you avoid hefty fines and protect yourself and your environment from hazards associated with hazmat storage. When you’re designing your hazardous material storage containers, you should know the characteristics and hazards of the substance you intend to store, such as the melting point, boiling point, and flash point (if flammable). The best way to learn this information is by looking on the substance’s Material Safety Data Sheet (MSDS). The MSDS will also include information on hazards associated with your hazmat storage. Knowing these hazards can help you understand how to mitigate them and protect your facility from dangerous incidents. If your hazardous materials are corrosive, your hazardous material storage containers should be designed to protect your personnel in the event of a leak. 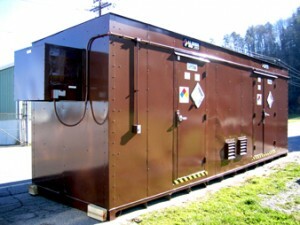 This can be achieved through secondary containment, which is designed to prevent the hazardous material from spreading. Some hazardous materials emit fumes which may be corrosive, toxic, or flammable. It is important for your hazardous material storage containers to be equipped with the means to prevent hazardous situations, and to deal with them should they occur. Mechanical ventilation can keep your hazardous material storage containers’ fumes below permissible levels, while protecting your personnel from toxic exposure levels and preventing fume buildup which may easily ignite. When designing your hazardous material storage containers, keep in mind hazards specific to your hazardous materials. Are they explosive? If so, you want to equip your hazardous material storage containers with explosion proof accessories and explosion relief construction. Are they flammable or combustible? Climate control and mechanical ventilation can prevent your hazardous material storage containers’ environment from reaching temperature and fume levels that may cause ignition. Fire suppression systems can provide your personnel or fire department the means to combat fires. Are they corrosive, or just toxic? Take steps to prevent leaks and spills from escaping your storage area. At U.S. Chemical Storage, we offer custom hazardous material storage containers to provide you with increased security and protection. We’ve got a long tradition of mitigating hazards and helping facilities safely and compliantly store their hazardous materials. If you’re looking to safeguard your community while facilitating the hazmat storage process, U.S. Chemical Storage is a name you can trust.